we will be showing our video footage of the grueling journey and resplendent coffee harvest, cupping many coffees of the gayo region (and the notorious kopi luwak), eating the food from those lush mountain villages, and embarking on a conversation with pendergrast and professors max savishinsky and joshua tewksbury. and enjoying chocolate from our inspired collaborators theo chocolate. "Few coffee drinkers suspect that they are affecting American foreign policy, the domestic policies of Latin-American and African countries, and the habitat of migratory birds. Pendergrast shows how and why they are. He has taken on a huge subject, but he organizes the facts skillfully and puts personalities in the perspective of their times. This encyclopedic volume is the entertaining result." --New Yorker on Uncommon Grounds by Mark Pendergrast. location: cap hill caffe vita. 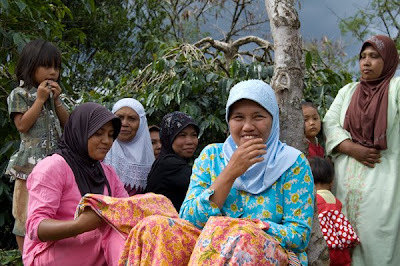 Second Sumatra Feast April 22nd... possibly even more rad than the first. $40.